This is a great soy wax melt starter set that includes everything you need to start burning these wonderful triple scented wax melts. You will receive a ceramic warmer for burning your wax melts. The Ceramic wax warmer is a beautiful blue-green color. You will also receive two 6 cube packs of triple scented wax melts. One 6 cube wax melt pack is the scent Blueberry Cheesecake (very welcoming aroma of baked vanilla cheesecake and fresh blueberries) and the other 6 cube wax melt pack is the scent Hazelnut Coffee (smells just like a hot cup of hazelnut coffee) for a total of 12 cubes. Both of these scents are some of our best selling scents. You will also receive four unscented soy wax tealights to place in the ceramic warmer to heat and melt your wax melts. Because every batch is made using our proprietary aging process, we recommend starting out with one wax melt cube in your ceramic warmer. One wax melt cube goes a long way. This set will also make the perfect gift. 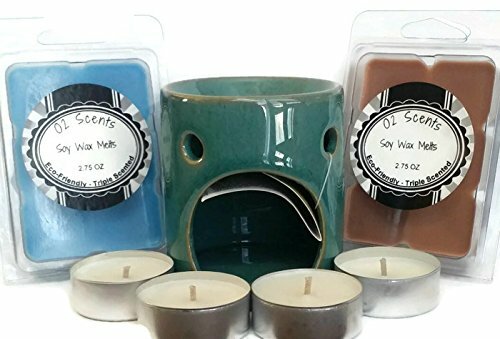 You will not be disappointed with this wax melt starter set!